Data Roads Foundation – Page 2 – All roads should lead to all people. The Rearden Labs whitepaper on “Distributed Input Distributed Output” (DIDO) wireless technology has disappointed me in many ways. 1. First, it didn’t really talk about the technology used. Radio frequency is just light outside of human visible range. Light does not interfere. Power over DataRoads: Energy competition through microgrids. Recent developments in small renewable power sources (like solar and small wind), as well as infrastructure destruction during recent tragedies (like Hurricane Katrina), have led some brilliant minds to rethinking the way we distribute and manufacture electrical power. Many of these studies all lead to the same conclusion: data networks allow us to carry enough information about diverse power sources and uses, so that they can be efficiently coordinated at small scale, over a simple grid of neighbor-to-neighbor transmission lines. These small power grids are generally called microgrids. These “smart power” grid networks function at fairly low data bandwidth, so smart grids can be built on top of (or to extend) normal network data lines. Author Data Roads FoundationPosted on November 8, 2010 Categories Checks and Balances, Defining Data Roads, Technology Watch, UncategorizedLeave a comment on Power over DataRoads: Energy competition through microgrids. Flipping the Internet upside-down, visually. I’ve rarely been accused of being too terse, or not technical enough. In the interest of brevity and clarity, I have created a visual representation of how it looks to flip the Internet upside-down, as suggested solely via text in an earlier post. Author Data Roads FoundationPosted on August 17, 2010 Categories Defining Data Roads, UncategorizedLeave a comment on Flipping the Internet upside-down, visually. These legislative propositions came to me as ideas that would ease Data Road equipment deployment in the future, but I think they could have a good (but more subtle) effect on their own, and with Network Neutrality legislation in general. Let me know if you agree. When global agreements aren’t necessary. I want to eliminate the need for ICANN — the group that decides all the Internet names! Did that get your attention? That’s good, but please note that I would like to have ICANN around for a very long time. The operative word in that first sentence is ‘need.’ I want to eliminate the need for ICANN, in the same way I want to eliminate the need for any world atlas when I’m only travelling just a few blocks away. While an atlas may be detailed enough to be useful for such a short trip, it’s definitely more cumbersome than necessary. I don’t even need to know the name of the city I’m in, if I’m only travelling along 1 street, just 2 blocks to the south. I could change city borders during that trip, and I wouldn’t need to realize it, unless there happened to be a wall at the city border line. In that strange case, the wall should have a plaque or guard that tells me about the city border. I don’t need the atlas if I can just read the plaque when I get there. Author Data Roads FoundationPosted on August 11, 2010 Categories Checks and Balances, Defining Data Roads, Uncategorized2 Comments on When global agreements aren’t necessary. Collective network ownership, a check on power mongers. I read the news too often. I say that because it’s too often depressing, which is not healthy for me. The prime example I have at the moment is this news from various sites, best summarized at BroadbandReports.com: the government is outsourcing Fourth Amendment violations to private industry. Some of the facts discussed here were not new to me, such as the old partnership between NSA and AT&T, as revealed by a courageous whistle-blower in San Francisco, Mark Klein. Inquiries over projects related to the NSA codename ECHELON have been public since 2000. Our defenders at the Electronic Frontier Foundation (EFF) and American Civil Liberties Union (ACLU) are still fighting for our rights to privacy from these corporate-government collaborative invasions. 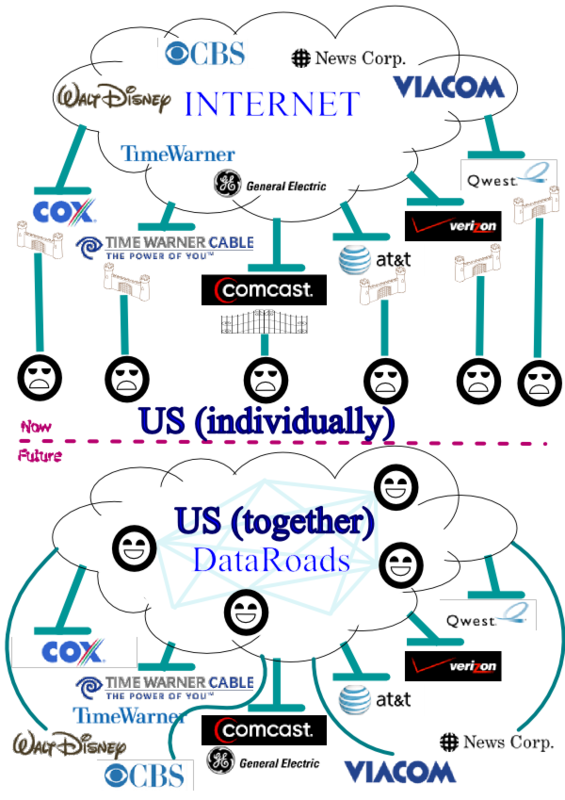 Author Data Roads FoundationPosted on August 3, 2010 Categories Checks and Balances, Defining Data Roads, UncategorizedLeave a comment on Collective network ownership, a check on power mongers.